Lightweight acne fighting lotion that effectively clears and prevents the formation of new acne pimples, blackheads and whiteheads. 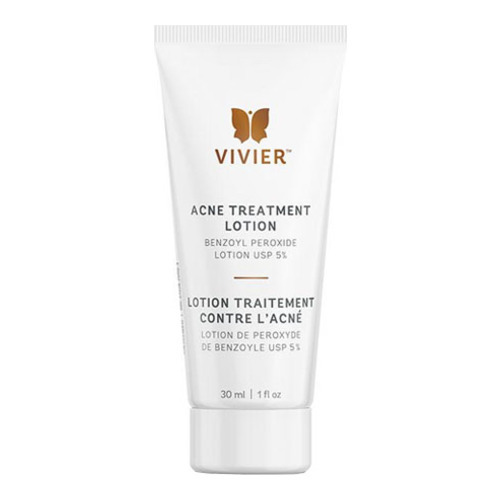 Formulated with 5% pharmaceutical grade Benzoyl Peroxide, this lightweight acne-fighting lotion is a concentrated acne-clearing treatment. This lotion effectively clears and prevents the formation of new acne pimples, blackheads and whiteheads. Ideal for acneic skin and may also be used as a spot treatment for occasional breakouts. • Wash hands with a non-medicated soap (contains no Benzoyl Peroxide). • Cleanse and dry face thoroughly before use. • Using fingertips apply evenly to affected areas. • Use both morning and night or as directed by a physician. • If dryness or peeling occurs, reduce application to once a day or every other day. • Fair-skinned individuals should begin with one application. • For more severe cases, and/or if substantial improvement is not apparent within 3 to 4 weeks, consult a health care practitioner.